BU records: Hankamer School of Business, circa 1930-2014 (#BU/102): Contains materials relating primarily to the school’s operations, with an emphasis on special events and programs. Joynes family papers, 1899-1929, undated (#3989): Letters and photographs to and from various Joynes family members. One of the family members, Claude Joynes, was in the McLennan County jail in May 1916, and wrote a letter about a mob probably coming to look for Jesse Washington, who was lynched five days later. BU records: Carl B. Wilson and Pat M. Neff’s “History of Baylor University” papers, circa 1936 (#BU/385): Includes a two-volume manuscript draft of “History of Baylor University” by Baylor University Professor Carl B. Wilson written in circa 1936. Fiesta de San Jacinto Association. An Invitation. San Antonio, TX: The Association, 1939. 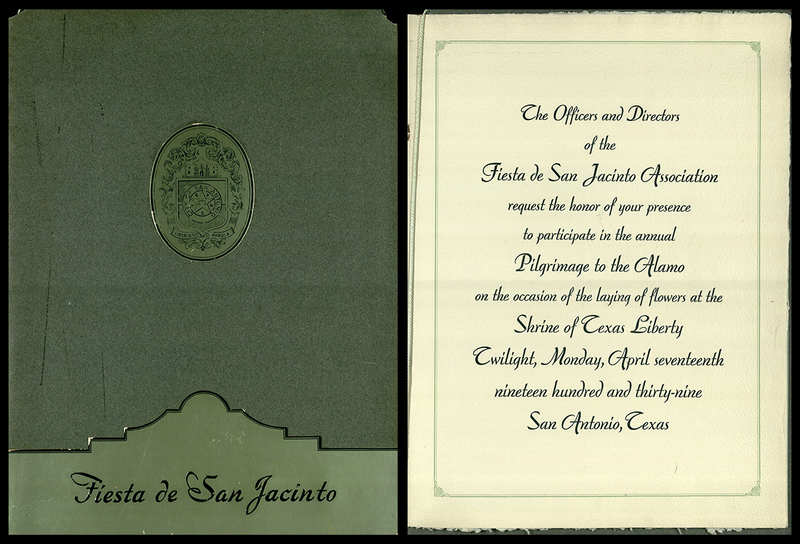 This oversized commemorative invitation to the 1939 Fiesta de San Jacinto, today known as Fiesta San Antonio, contains information about the event as well as beautiful full color illustrations. Parent-Teacher Association. Hostess Reference Book. Greenville, TX: circa 1920. Texas Tables: the Junior League of North Harris and South Montgomery Counties, Inc. Nashville, TN: Favorite Recipes Press, 2010. Murphy Family Cookbook. Wortham, TX: circa 2000. The Texas Collection is home to more than 5,000 Texas cookbooks. The three represented here vary greatly in age and authors. Even though the cookbooks are intended for different audiences, they all offer great insight into Texas cookery, whether the cookbook is created for a family and is filled with family memories or is created to raise funds for an organization. The Baylor University business school began in 1923 and became known as the Hankamer School of Business in 1959 when Earl C. Hankamer gave most of the money needed for the school to have its own building. This Windy Drum photo was taken shortly after construction was completed. Baylor–Buildings–Hankamer School of Business. Fortunately, freshmen aren’t imposed on anymore to use the toothbrush method to keep the Pat Neff Hall seal clean–and the seal is roped off to keep people from walking on it. It’s back to school today—time for a quiz! These Baylor trivia questions are drawn from things I’ve learned through assisting patrons with reference questions. Test your knowledge of the green and gold—or learn more about Baylor’s past! When did Baylor have its first female yell leader? What does legend say is buried near the swing in Burleson Quadrangle? How many years elapsed between when Tidwell Bible Building was first proposed and when it was completed? True or False—A Baylor student designed the Baylor seal in the floor of the Pat Neff Hall foyer. How much money did George W. Truett raise to eliminate Baylor’s debt in his role as financial agent in the early 1890s? Sociology is a part of the College of Arts and Sciences now, but it hasn’t always been housed there. In what school did it reside in the 1920s? What subject did the first African-American professor at Baylor teach? How many classes celebrated their graduation at Baylor Stadium (now Floyd Casey Stadium)? Who coined Baylor’s motto, Pro Ecclesia, Pro Texana? The female yell leaders in this 1970s photo were not the first. Weta Timmons was elected a yell leader in 1923 and is heartily commended for her efforts in the Lariat. However, after her term and up to 1968, there were no female yell leaders. The decision to break that gender gap was much debated throughout the 1960s. a) Bill Daniel Student Center. From 1953 to about 1964, the AFROTC competitive shooting team carried rifles up four flights of stairs to the attic of the Student Union Building and practiced target shooting. Apparently you could hear the shots outside the building (through air vents) but not inside. An “Indian princess” from the Huaco Indian tribe. When Colonel Joseph Warren Speight owned the property, his daughters found turquoise beads beneath a tree where they were playing. Speight investigated and found the skeleton. According to a Huaco legend, a plague befell the tribe. The chief’s beloved daughter helped nurse the ill but eventually died herself, and the bones are hers. In the 1930s, a marker declaring the grave to be that of “an Indian Princess” was erected on the site but was later removed and then returned in 1988. True. Enrique Ramirez designed the seal for the building, which was completed in 1939. Ramirez was an art student who did various art and design projects for the university throughout his time at Baylor. Truett raised $100,000 in two years. Benajah Harvey (B.H.) Carroll, the president of the board of trustees, offered the job of financial agent to Truett, who accepted the position but suffered a bad case of the measles before he could start the job. After completing the fundraising project, Truett enrolled at Baylor as a student in 1893, and, of course, went on to become a major figure in Texas Baptist history. In 1990, Baylor claimed his name for a future seminary, and in 1994, the first students began classes at George W. Truett Theological Seminary at Baylor University. Check out the George W. Truett papers at The Texas Collection. We also have many of the books he authored and audio recordings of his sermons. The School of Commerce and Business Administration, which was founded in 1923 (and now is known as the Hankamer School of Business). Political science and journalism are a few other departments that were housed in the new program but eventually were moved to the College of Arts and Sciences. Vivienne Malone-Mayes was hired as a mathematics professor at Baylor in 1966—only five years after she had been denied admittance to the school as a graduate student. She was among the first black women in the nation to earn a PhD in mathematics. Check out the Vivenne Malone-Mayes papers at The Texas Collection and her oral memoirs from the Institute for Oral History. Five. The classes of 1951-1955 celebrated commencement exercises at Baylor Stadium. In 1956, President Eisenhower came to Baylor and gave the commencement address. According to the Lariat, his advisors “much preferred that he speak in a completely enclosed building,” so the venue was moved that year to the (un-air conditioned and thus very warm) Heart O’ Texas Coliseum. Commencement was held there until 1988, when the Ferrell Center was constructed. Rufus Burleson. When he accepted the presidency of the university in 1851, he included an outline of institutional policies. Number eight on the list was, “The mottoes of Baylor University shall be, “Pro Ecclesia, Pro Texana;” “Dulce et Decorum, pro patria Mori.” The Baylor seal still boasts the first motto, which translates to “For Church, For Texas.” The latter quote is attributed to the Roman poet Horace, and roughly translates to, “It is sweet and proper to die for your country.” It fell out of use as an official slogan—really, it’s not clear if it ever was adapted. Check out the Rufus C. Burleson papers at The Texas Collection. You can read more about these stories and many others in the digitized Lariats, Round-Ups, and press releases, just a few of many Texas Collection items that can be found on the Baylor Digital Collections site. And if you want to investigate even further, drop me a line at The Texas Collection—we have archival records on many of these people and places. The designs for the new Hankamer School of Business (HSB) building reflect a state-of-the-art facility that will provide the latest in technology to advance student learning and innovation. The school has outgrown its current facility across the street from us on 5th Street, but back when it was conceived and built in the late 1950s and early 1960s, that building, too, was a high-tech place. Baylor University’s Hankamer School of Business, Windy Drum Photo, 1961. Yesterday Baylor announced the naming gift for the new campus. With hopes for construction to start in December 2013, soon business students will attend classes at the Paul L. Foster Campus for Business and Innovation. And Paul Foster follows in the footsteps of other leaders who have helped to make innovation possible for the School of Business. Baylor University’s Hankamer School of Business Groundbreaking: Earl C. Hankamer breaks ground at the event on March 11, 1960. Although Baylor’s School of Business was established in 1923, it didn’t really have a proper home until the late 1950s—classes were held all over campus, including in the Student Union Building. A gift of more than half a million dollars from Mr. and Mrs. Earl C. Hankamer on March 20, 1959, changed that. Their donation was added to an existing amount previously raised to build the new $1 million business school building. The first classes in the new building, with the school now named after Hankamer, were held on May 5, 1961. Hankamer and Paul Foster have more than generosity in common—they share the oil business too. Earl C. Hankamer was one of 13 children and was from the town of Hankamer (named after his pioneering family), in Chambers County, Texas. After working his way through school at various jobs, he completed his bachelor of arts degree from Baylor in 1915. He then went on to be a prominent Texas oilman. As noted in his obituary, he was known as “an unpretentious businessman who gave millions to various educational and medical programs while insisting his efforts should go without praise.” Mr. Hankamer also gave of his time, serving on the Baylor Board of Trustees for 41 years, and 15 years as chairman of the board for the Baylor College of Medicine. Baylor University’s Hankamer School of Business, under construction, Windy Drum Photo, c. 1960. So the Hankamers laid the groundwork for the current facility, but in 1962, it got another boost in the form of a gift from Baylor trustee and businessman, Carl Casey. This would enable the purchase of a historic campus first: an IBM 1620 Data Processing System. Baylor University, Hankamer School of Business, Casey Computer Center: IBM 1620 Data Processing System, the university’s first computer, acquired in 1962. Not many universities had computers at this time or taught computing courses. This was the first computer at Baylor available for student use and would be housed at the HSB campus. The unit carried a price tag of nearly $100,000 but was discounted to $40,000 after an educational grant. To house the new computer as well as the existing punch card devices in the business school, Baylor added the Casey Computer Center to the business school building. But how to use this new technology? Dr. Helen Ligon, who would later become a professor in the Information Systems department, received specialized training in Dallas to operate the new IBM 1620. Dr. Ligon had started teaching at the business school in 1958 as an instructor in shorthand, report writing, and letter writing, so this was quite a shift for her. However, it was not long before Dr. Ligon and others at Baylor would see the benefits that the computer could have to the department and the entire university. According to the press release accompanying this photo, Helen Ligon, Louis Pisaturo, and Loren Decker examine a printout from the new IBM System/3 computer installed in Baylor University’s Hankamer School of Business in 1974. This computer replaced the IBM 1620…and the computers have been getting smaller ever since! The acquisition of this IBM computer would help lead to the development of the Management Information Systems courses taught at the HSB today. Dr. Ligon saw the potential of the computer for teaching, research, and business operations applications, and courses based around the use of the IBM 1620 began. The computer not only served the HSB, but also those doing research in education, math, science, psychology, or any department at Baylor University that needed this type of specialized equipment. As Dr. Ligon noted, the machine could perform in hours calculations that would take a human months or years to complete. Of course, many others have continued to support the development of learning spaces for Baylor business students, from the Cashion Academic Center to specialized classrooms like the Southwest Securities Financial Markets Center. These contributions, and now that of Paul L. Foster, follow in the footsteps of the gifts from the Hankamers, the Caseys, and the faculty and staff like Dr. Ligon who helped to bring these spaces to life with learning opportunities for students. As the new building begins to take shape, we look forward to seeing how future Baylor business leaders will make the most of their new home. View our Flickr slideshow below to explore the construction of the current business school building and the evolution of technology at Baylor, from typewriters and adding machines to personal computers. “Hankamer orders computer for processing mass data.” Baylor Lariat, 1962 January 9, p. 1. “Machine plays ball, beats Lariat’s all-star team, 4-3.” Baylor Lariat, 1962 September 20, p. 1. “The machine was asked, ‘will the Bears win Saturday? '” Baylor Lariat, 1964 October 23, p. 14. “Computers make Baylor ‘first class. '” Baylor Lariat, 1967 January 6, p. 4B. Baylor University Subject File: Buildings: Hankamer School of Business. The Texas Collection, Baylor University. Baylor University Subject File: Hankamer, Earl. The Texas Collection, Baylor University.